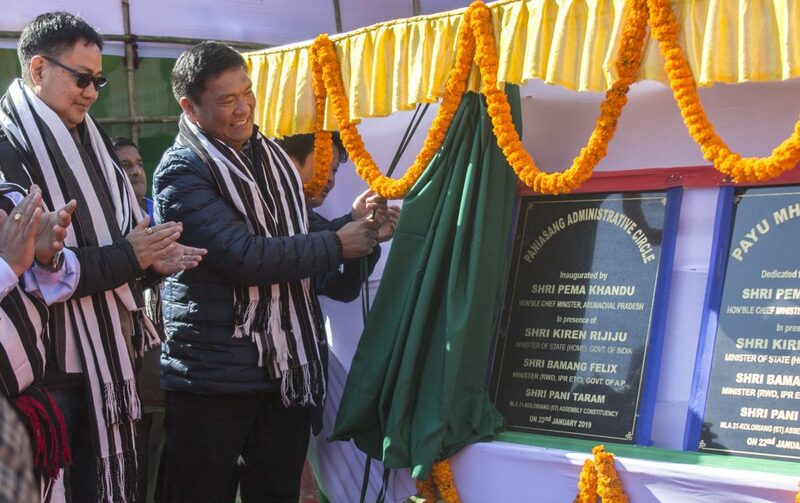 Arunachal Pradesh Chief Minister Pema Khandu on Tuesday launched the third leg of ‘Arunachal Rising’ campaign at Daporijo in presence of MoS for Home Kiren Rijiju, MLAs Punji Mara, Pangka Bage and Dikto Yekar and other dignitaries. On his arrival at Daporjo, the chief minister inaugurated the mini outdoor stadium, extension of community hall at Ekke village, cement concrete steps and concrete railing at Ringdo Tarak and Riley Sokio, extension of Mell Botom tourist lodge, model district library and reading room, installation of solar street light at model village Taksing and Gelemo and approach road from PWD road to Gumsing model village. Khandu further visited the Sarkar Aapke Dwar camp being held at Si-Donyi ground and inspected the stalls put up by different departments. He appreciated the successful campaign carried out by the district administration and lauded for reaching out to more than 12,000 beneficiaries in more than 8 Sarkar Aapke Dwar camps conducted so far. He also appreciated the administration for registering more than 200 families for free LPG connections under Pradhan Mantri Ujjwala yojana. The chief minister, on the occasion gave away free LPG connections to the beneficiaries. He also felicitated the ASHA, Anganwadi workers, progressive farmers and the winners of the essay competition of Arunachal Rising campaign. He also issued certificates to the beneficiaries under National Social Assistance Programme. Khandu further released the Arunachal Rising campaign brochure and pamphlets that contains detail information on all flagships programmes of the state and the centre. He appreciated the district administration for bringing out such valuable booklet and requested it to be distributed widely to the public. He informed that under PMGSY, the Centre has allotted about Rs 4000 crore and more funds are waiting to be sanctioned. “Upper Subansiri district alone has 10-12 projects under PMGSY sanctioned,” the chief minister announced. At Taliha:Speaking at a public function here, Chief Minister Khandu said a roadmap is being prepared and state government with help from centre is working to develop connectivity in the Taliha and Nacho areas. He said once connectivity improves, the region will see decrease in distress migration as people are migrating towards district headquarters Daporijio for better facilities and opportunities. On the occasion he informed that under PMGSY, five road projects have been launched in the Nacho-TALIHA region. Informing more about development projects in the region, the chief minister said that more than Rs 10 crore will be sanctioned for construction of a meeting hall in Taliha. He further informed that Rs 10 crore has been sanctioned already for construction of a stadium here. At Koloriang:Earlier on Tuesday, the chief minister along with MoS Rijiju reached Koloriang, the district headquarters of Kurung Kumey. In his public speech here, Khandu commended the appreciable work done by local MLA Pani Taram and assured to conduct the first development meeting of the new government here once it is formed after the 2019 elections. He said the state government had earlier created about 400 teachers post for SSA teachers. Earlier, the chief minister dedicated the Paniasang administrative circle, 2x500kw Payu micro hydel scheme, district museum, district court, Chera Talo district hospital, office of the superintendent of police, mega water treatment plant, working women hostel, rural works department sub-division at Patuk and Government Secondary School at Nikja. He also laid foundation for an Industrial Training Institute and fire station. AT Nacho:Addressing a public function here, the chief minister said people of Arunachal are largely unaware of government programmes and policies and hence they fail to avail benefits from them. He said to bridge the gap between the government and the people a Jan Sampark Abhiyan has been started under the banner of Arunachal Rising Campaign. The Arunachal Rising campaign aims at reaching out to the people throughout the state targeting remote areas and making them aware of the government initiatives, policies and programmes.